After boarding their black Gangster our guides “Shoulders” and “Louie” gave us the lowdown on the Windy Cities historic underbelly. “In 1920 the Volstead Act enacted the 18th Amendment. Prohibition which prohibited the manufacture, transport and sale of liquor,” Shoulders said. Prohibition officially began on January 16, 1920, a full year after the ratification of the 18th amendment. The Volstead Act Shoulders added kicked off the Prohibition Era and speakeasies sprang up around the city that became divided into three different gangster groups, the Irish, Sicilian and Italian. While many of the gangster happenings were now gone, the Biograph Theater is one gangster haunt still standing. This is where John Dillinger was shot. 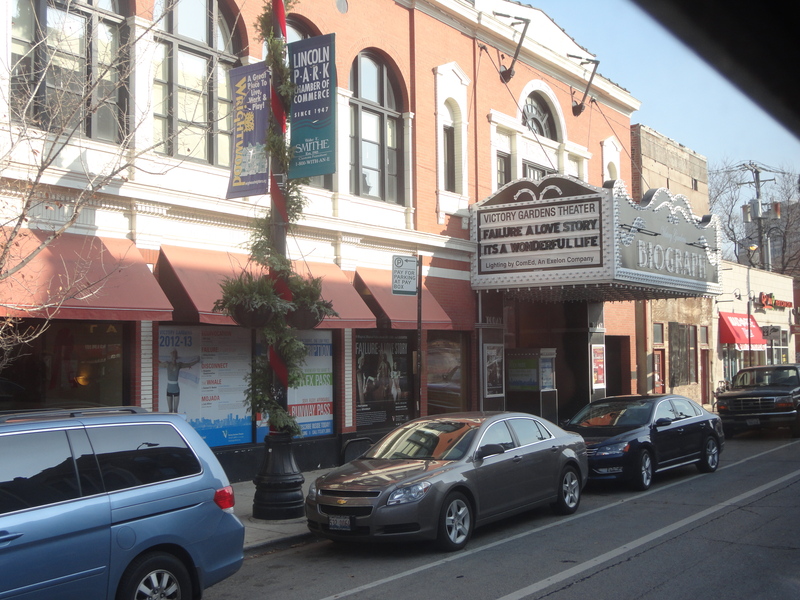 Located at 2433 North Lincoln Avenue, originally a movie theater, it now features live productions. The movie was seen in the recent Johnny Depp “Public Enemies” where he portrayed Dillinger whose escapades were right about the time of the repeal of Prohibition which took place on December 5, 1933. John Dillinger’s reign of terror was from September 1933 until July 1934. Over the less than a year that he and his violent gang reigned supreme in the Midwest, they managed to kill 10 men, wounded 7 others, robbed banks and police arsenals, and staged 3 jail breaks and even murdered a sheriff during one and wounded two guards in another. Our guide on the Untouchables Tour called Dillinger “The farmer outlaw” and said that he grew up on an Indiana farm, but that came later in life. He was born John Herbert Dillinger on June 22, 1903 in the Oak Hill section of Indianapolis. It was after his mother died when he was three and his father had remarried that he moved to the farm when an adolescent. Most of his youth was spent in prison and eventually when Anna Sage, a Romanian Madam that had come into the US illegally turned over information in exchange for Immigration stopping deportation proceedings, Dillinger’s fate was sealed. She identified him to the FBI agent Melvin Purvis’s men outside the Biograph where he was shot dead. The Untouchables Tour is fun, educational and a great way to get a new perspective on Chicago! Call 773-881-1194 or log onto www.gangstertours.com for more information.